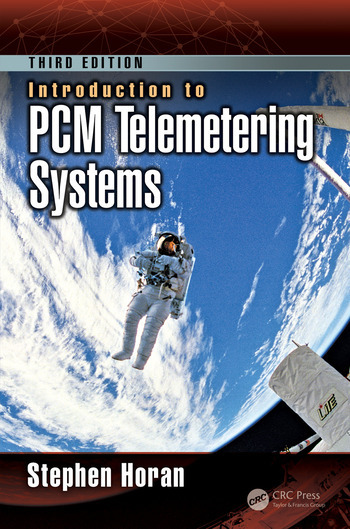 Introduction to PCM Telemetering Systems, Third Edition summarizes the techniques and terminology used in sending data and control information between users and the instruments that collect and process the data. Fully revised, it gives an overall systems introduction to the relevant topics in three primary areas: system interfaces; data transport, timing, and synchronization; and data transmission techniques. Integrating relevant information about the process at all levels from the user interface down to the transmission channel, this will also include how designers apply relevant industry and government standards at each level in this process. Homework problems are included at the end of each chapter. Telemetry and command computer systems. Introduction. Objectives. Computer systems. User interface systems. Payload systems. Secure communications. References. Problems. Signal processing. Introduction. Objectives. Sampled versus continuous data. Signal types. Bandlimiting. Sampling theorem. Filter design. Software filter design. Quantization. Sampling hardware. References. Problems. Contents. Ii data transport, timing, and synchronization. Telemetry frames and packets. Introduction. Objectives. Background. Telemetry frames. Irig class i and class ii telemetry. Synchronization codes. Telemetry frame design. Packet telemetry. Mil-stdpackets. Ccsds packets. Data networking packets. Command processor interface. Formatting for transmission. References. Problems. Contents xi. Data synchronization. Introduction. Objectives. Synchronization process. Carrier synchronization. Bit synchronization. Pdu synchronization. Error detection. Data sequencing. References. Problems. Time and position determination. Introduction. Objectives. Definition of time. Time code formats. Iso. Irig. Nist. Ccsds. Gps time and position. References. Problems. Xii contents. Command transmission systems. Introduction. Objectives. Command composition. Command transmission strategies. Operational considerations. Packet command systems. References. Problems.Iii data transmission techniques. Modulation techniques. Introduction. Objectives. Analog modulation. Digital modulation. Bandwidth estimates. System planning. Contents xiii. Digital transmission with analog modulators. References. Problems. Microwave transmission. Introduction. Objectives. Background. Rf devices. Free space propagation. Atmospheric, sun, and ground effects. General terrain fade margin. Rain effects modeling. Mobile propagation. References. Problems. Xiv contents. Stephen Horan, Ph.D. is an electronics engineer with the National Aeronautics and Space Administration’s Langley Research Center. Dr. Horan joined Langley in 2009 as a spacecraft communications lead for satellite and hosted payload concepts. He has also served as the Branch head for the Remote Sensing Flight Systems Branch. Starting in August 2013, he became the Principal Technologist for Avionics in NASA’s Space Technology Mission Directorate. Dr. Horan is also a Professor Emeritus at New Mexico State University where he held the Frank Carden endowed chair in Telemetering and Telecommunications from 1996 to 2009 when he retired as a Professor and Department Head in the Klipsch School of Electrical and Computer Engineering. At NMSU, he developed the graduate telemetering systems course at the Klipsch School and the industry short course upon which this text is based. He taught other courses in communications systems and was the principal investigator on several telemetry and telecommunications projects at NMSU. Dr. Horan received his A.B. in physics from Franklin and Marshall College, and his M.S. in astronomy, M.S.E.E., and Ph.D. in electrical engineering from New Mexico State University. Dr. Horan’s research focus was in the area of space communications under the support of NASA and the Air Force, including leading the development of the communications system for the 3 Corner Satellite and the NMSUSat nanosatellite projects. Prior to joining the NMSU faculty, Dr. Horan was with Space Communications Company (now part of General Dynamics) working in the areas of satellite telemetry and telecommand systems, operator interfaces, and systems engineering at NASA’s White Sands Ground Terminal. Dr. Horan is a senior member of the IEEE and AIAA. He also holds amateur radio license NM4SH. He has been a NASA/ASEE Summer Faculty Fellow at Johnson Space Center and Goddard Space Flight Center. "Dr. Horan has taken the best end-to-end textbook on telemetry systems and updated it to include important emerging issues in the field. For example, in the area of smart sensors, Dr. Horan has added coverage of RFID while in the area of computer systems elements, he has added a section on secure communications." "…a very good reference book for those who work in the aerospace and space flight arenas, especially for those who are not well versed in the telecommunication field. If nothing else, learning about the jargons and basic building blocks in telemetering systems, and seeing real life examples will help lower the anxiety level when dealing with the field as a part of a person’s job."